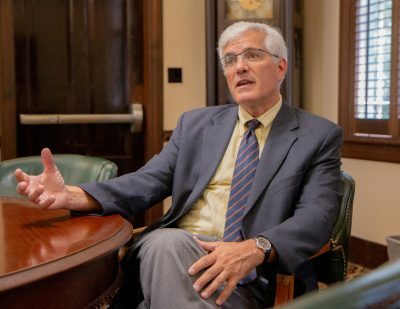 Tim Elgren was preparing to go on sabbatical from dean of the College of Arts and Sciences at Oberlin College when he heard Stetson University was looking to expand its health and science programs. Elgren, Ph.D., also a professor of chemistry and biochemistry at Oberlin, recently was named Stetson’s Special Advisor on Strategic Initiatives and is charged with overseeing a yearlong effort to develop a framework for new science programs at Stetson. His appointment follows an $18 million donation in April from longtime Stetson Trustees Cici and Hyatt Brown to construct a new science building on the DeLand campus. With the gift, the university hopes to improve health in western Volusia County, expand partnerships for the benefit of students in health and science, examine its offerings in health, and explore new interdisciplinary opportunities for undergraduates. 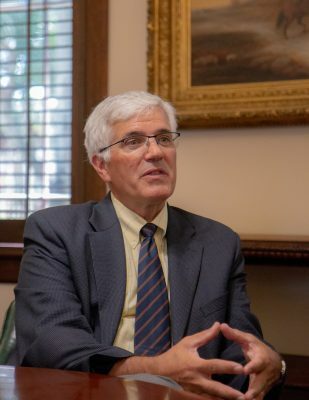 Elgren said he played a role in expanding the sciences at Hamilton College in upstate New York, where he was for 21 years – rising to the rank of professor of Chemistry and served as associate dean of the Faculty. 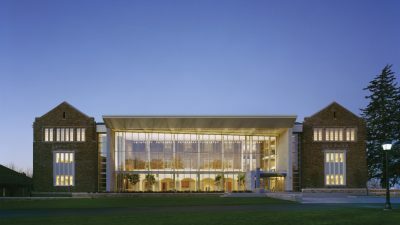 The private liberal arts college, with 1,900 undergraduates, opened a new $56 million science center in 2005 that “transformed the institution,” he said. At Oberlin College in Ohio, a new science center was constructed about the same time and “became transformative, as well,” he added. Elgren sat down with Stetson Today last week while he was settling into his office in DeLand Hall. He plans to work on campus for one week a month and then work remotely from Bozeman, Montana, where he and his wife Gail Johnson, a physician, have relocated for his yearlong sabbatical. Could you talk a little about your role at Stetson and the process that you will follow? The appointment is to work on strategic initiatives, and the focus is the science and health science initiative. Right now, it is thinking about what the frontiers are for growth and what those opportunities are in the areas of science and particularly health sciences. That may be forging partnerships. It may be building curriculum. It may be building buildings. 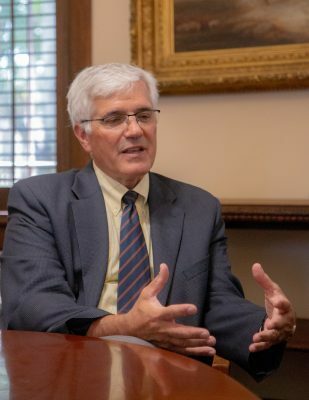 As we think about, with the faculty, what those opportunities look like, it will be a slate of strategies to think about new opportunities for Stetson students and how that prepares them to step into roles of service and leadership in these areas. Those are the kinds of things that are exciting with this gift from the Browns, which is the catalyst for what we’re doing. My appointment is for the year. My goal is to, within this year, help Stetson put together a strategic set of opportunities that they can start to pursue. Framing those is the goal of this year. The faculty process will be essential to think about how these things get vetted, how they become formulated and ultimately implemented. It’s early in the game and so as I come in as an outsider and look at some of the incredible opportunities that Stetson faculty and students have ahead of them, it’s an exciting time for them. And I’m thrilled to be a part of that conversation. Have you led this kind of effort before? When I was at Hamilton, we built a $56 million science building, which really transformed the institution. The institution had long been known as an extraordinary liberal arts college with great prep in the humanities and in the social sciences, and good sciences. And right now, they’re great sciences and it’s because a building was transformative for them. 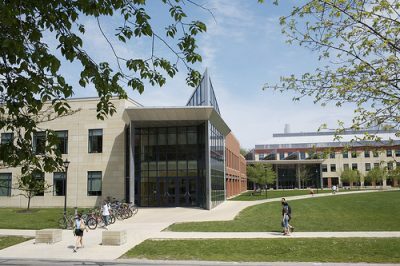 Oberlin’s Science Center was built in 2001 and houses biology, chemistry, neuroscience, physics and the science library. Read more. Certainly, Oberlin has a similar history. They also had, about the same time, a building project that became transformative as well. But Oberlin comes from a place where it’s not thought of as a science school. One percent of the National Academy of Sciences are Oberlin graduates, so you would never think that of a liberal arts college. These are places where important preparation to have an impact in science happens. So how you create the knowledge, skills and disposition of a scientist can happen in profound ways at our liberal arts colleges. And yet people don’t always view liberal arts as good training for the sciences. The evidence is that there’s a profound strength that comes from the ability to not just think about what you’ve been trained to do, but also think about what the next question is. So, if you are being trained in an environment that fosters refining that question and the strategies for pursuing it, it’s not just about your knowledge base, and particularly in this new world of readily available information and knowledge becoming transient, the real power is going to be asking the right question and accessing that information. So, how do we position ourselves as institutions to be at the forefront of training our students and helping them become the agents of access for that information, not necessarily those who have it at the ready, but they know how to access it, they know how to use it, they know how to refine their question and get to the right answers. And those are the strategies of a scientist. It’s interesting because in this moment in time when the liberal arts are getting attacked regularly for their lack of relevance is in fact when they are among the most powerful preparations for being an agent of change in the world. Science, in particular, was the place where experiential learning had its roots in undergraduate research, and certainly study away was a way in which students could get an opportunity to engage the world and then come back and reflect on it. These can be profound experiences and assessment shows that study away and undergraduate research are two of the most impactful and transformative experiences that a student can have in college and it’s because of this opportunity to experience and put into practice what they’ve learned. So, I think the notion at Stetson of bringing theory to practice is really an important opportunity. And it couldn’t happen at a more important time. Why is this an important time? Because the model is so deeply challenged. People are questioning not just the value of a liberal education, but also the value of education and the return on investment. And so right now, there’s not just an ask, but a demand of us to demonstrate that this education is preparing them not just for the aspiration of a life of impact and a life of learning, but the promise of being able to put that to use. This incredible gift invites all of us to look further and extend our reach and think about what we can do that could help us with the emerging demographics of who goes to college and who goes to Stetson, and think about serving new populations, which is going to be essential with the demographic shift of the aging population and the decreasing number of students who are going to college. Could you talk a little more about extending Stetson’s reach? 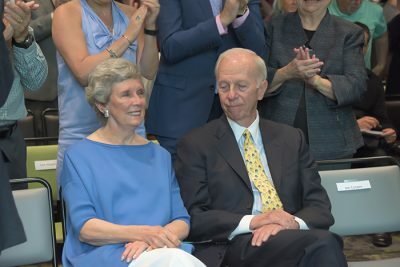 Cici and Hyatt Brown received a standing ovation for their support and service to Stetson University when their $18 million gift was announced April 9, 2018. Read more. The Browns are thinking of how you build the capacity of the community to take care of itself and that’s a really important question. It impacts the environment, like the water program here, and the environmental program is already a very strong program. Now, I think what you’re looking for are corollaries to those that think about human health, and how we can serve that population in this area because there’s huge demand. There are well-paying jobs. There’s opportunity. Feeding into those areas where you know there are opportunities, that will be exciting for students because they can see their hard work is going to lead to the kind of career that will be rewarding and have an impact on the community. And that can extend the reach of Stetson by attracting students who may not have considered it. I think health partnerships are a critical piece. Having health partners with not just the obvious places, like the hospitals and the health care providers, but also the public health system. Those become great agents of access to what the community needs. I don’t know this area, so this is one of those pieces of the planning process where assessing the needs of the community will be an important step. In Utica, Hamilton partnered with the local health service to think about lead poisoning. The health department gets that data from kindergartners – the blood data to show where you have lead exposures. They have all that data with GIS information and so you can look at that with Census data. When you start to think about health informatics, you can start to look at the geographic distribution of those kinds of health threats and the neighborhoods where they reside. For Utica, that meant interesting health partnerships because the health department partnered with the Community Foundation and local churches to provide high-volume vacuum cleaners that they would use because these old houses had a lead aura from the lead paint. So, they would use these high-volume vacuum cleaners in their window sills and around the baseboards, and they would reduce the amount of lead dust in the house and therefore reduce the exposure to the kids. During your yearlong study, will there be opportunities for the Stetson Community to provide input? Provost Noel Painter is assembling a committee to work on this and that steering committee is the one that will help channel all these things through the faculty governance structures that are going to be required for any new initiatives, and the faculty governance structures will do the outreach to the faculty and the community to make sure they get their input. That will come as the process starts to evolve. I am honored to be working with you and excited for what this extraordinary gift presents as opportunities to think about what the frontiers of coupling liberal arts to the health sciences and community engagement might bring.